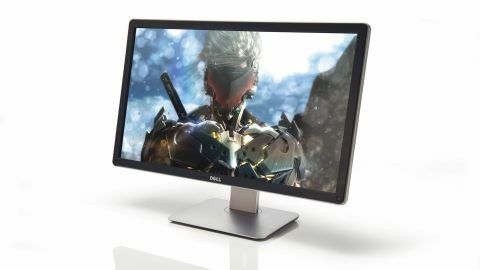 A fantastic monitor that's a little ahead of its time in terms of GPU and operating system support. Call it 4K. Call it ultra-HD. Either way, massive pixel counts are the next big thing. This year's festival of rampant consumerism at CES in Las Vegas is a case in point. Inevitably, a tonne of 4K HDTVs filled the field of view in every direction. But the show also saw a several 4K and UHD laptops. Meanwhile, phones with 1080p pixel grids are becoming commonplace. Likewise tablets with beyond-1080p panels, including Google's 2,560 x 1,600 Nexus 10, are now almost routine. But what of the PC? Sadly, it's been a bit of a 4K laggard to date. So far, we've only reviewed a single 4K PC monitor, the Asus PQ321. It's absolutely, positively gorgeous. But also punitively priced. So expensive, in other words, as to be pretty much irrelevant to most PC lovers. That's actually pretty ironic, because if there's any device that is ready and able to make the most of 4K resolutions right now, it's the PC. 4K HDTVs, quite frankly, are a gimmick. There's simply no content to watch. Super high res tablets and phones are marginal, too. But not PCs. Ramp up the res and you can immediately enjoy the boost in desktop elbow room, although you may run into scaling and DPI problems with Windows. More on that momentarily. Applications such as photo editing benefit from more pixels, too. And then there's gaming, where the argument is more finely balanced. In theory, you can run pretty much any game at full 4K. Most will offer the option to render at the maximum resolution of your graphics subsystem. And render they will. They only slight snag involves achieving that at playable frame rates. As we explained in our Asus PQ321 review, 4K is essentially four times the pixels of 1080p. So that's four times the work load for your GPU. Cripes. Anyway, it's into this broader context that we introduce our second ever 4K PC monitor review. The specimen in question is Dell's new UltraSharp UP2414Q. It sports precisely the same 3,840 by 2,160 as the ground breaking Asus PQ321. But there are two big differences. The first is price. The new Dell is less than half as costly. Still not exactly cheap, but much, much more accessible than the exotic Asus. The second major change up involves panel proportions. The Dell spans a mere 24 inches. So that's unbelivably expensive for a 24-inch monitor. Yikes. Of course, you could argue that size doesn't determine desktop real estate, resolution does that. And you'd be right. But some will still baulk at the very notion of paying so much for a panel size that can be had for little cost these days.